Today Vice President Biden will meet with law enforcement leaders for the first time as the head of an interagency effort to curb gun violence. 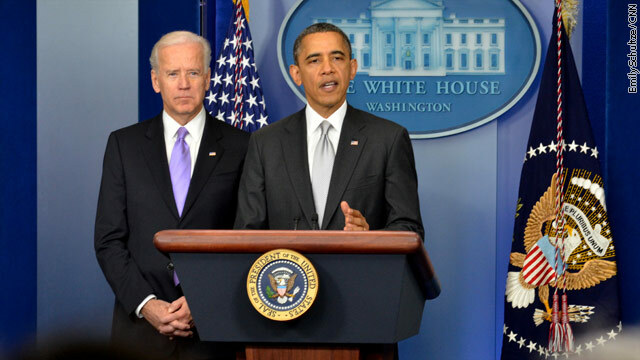 Yesterday in the briefing room President Obama announced the initiative to shape the administration's response to the tragic shooting in Newtown Connecticut. Also attending the meeting, Attorney General Eric Holder, Secretary of Education Arne Duncan, Secretary of Homeland Security Janet Napolitano, and Secretary of Health and Human Services Kathleen Sebelius. The fiscal cliff is looming over the nation and President Obama has promised to veto the latest effort called "plan B" by Majority Leader John Boehner. Boehner on Tuesday proposed a "plan B," which would extend Bush-era tax cuts on income of up to $1 million. He described it as a fallback option to prevent a sweeping tax hike while negotiations continue on a broader plan. In less than two weeks the nation's taxpayers would face automatic tax increases and deep spending cuts if no agreement is reached. A senior administration official said no talks or meeting with Rep Boehner are scheduled at this point but continued "Anything's possible". The President will attend meetings at the White House. These meetings are closed press. The majority voted for plan A...and Boehner wants to give us Plan B the same old GOP B ull. Boehner and the rest of the Repubs only care about the wealthiest Americans. More than 70% of the money contributed by the NRA and gun lobbyists went to Republican candidates. Why? Because they want their rich buddies to keep on making money on weapons such as the AR-15 assault rifle that killed 20 children in Newtown. Right now, we have more gun dealers in U.S., than McDonalds. Since the Brady Act expired in 2004, there have been 61 mass gun murders in the U.S. There were nearly 10,000 gun deaths in USA in 2010, compared to 41 in Britain which as sensible gun control laws. More guns have contributed to the most violent society in the world! Whether I agree or not is beside the point. That was pretty good Jean. What about the other 7 days? We are just 5 days out from Christmas...and Bonehead is working hard at playing silly go nowhere games ...which probably means we are going over the cliff. At 77, I have lived through all levels of tax rates, and the Clinton era rates were by far not the worse. I won't take credit for the words or the melody. The words are from Mark Fiore at The Daily Kos...and we all know the song. I thought the idea was far too good not to share....being this was a busy day; as most are at this time of the year. Boehner gave you the Cold Hard Facts of life. You just want to ignore them. Why do you want to screw the Rich people out of their money? They earned it. Book your own freaken life. Just because Reid, Pelosi, and Obama won't negotiate doesn't mean you should take it out on Boehner, but nice effort I gotta say. OF LIFE AS A REPUBLIC. HE IS A VERY SICK MAN. HE WAS NEVER VETTED AS ALL OTHERS HAVE BEEN AND NEVER EVEN HAD A PHYSICAL AS ALL OF HIS PREDICESSORS. HE IS JUST ABOVE ALL OF US OR SO HE FEELS. GREAT. NO ONE,NO ONE WILL WILL DESTROY THIS NATION. Plan A is the President's plan. This may be the last piece of legislation Pres. Obama ever gets through Congress, and that may be no exaggeration either. Just give some honest, reflective thought here to the impact that this little piece of legislation might have in order to be "effective". And before you make up your mind think about how firmly entrenched gun violence is in the American culture and psyche. And how much Americans are entertained by the words, images, and emotions that violence invokes albeit in a presumably fictional context. But for every vicarious thrill from gun violence a fictional episode invokes, there is a real life experience behind it and a cultural infrastructure. Americans accommodate gun culture and profit from it, all of us do in spite of what the cultural elitist, hypocrites say and do. What do you think will happen to the entertainment industry if the necessary changes are made to American culture in order to promote a more peaceful society – a kinder gentler, America and the economy at large? Give just a little thought to the economic impact. How much of the American economy is do you think is based on "gun violence"? And do you think a violent world would welcome such a shift in American culture? And what about the impact of sensationalism of gun violence by the media and press, is the media willing to self censor in order to make the necessary cultural changes, or does the government need to impose a censorship board to get the media to tone things done so that Americans can properly shelter and promote "peace" in their kinder, gentler culture. Perhaps the powers-that-be should look to some other societies as a model for this type of culture such as China. They seem to be doing pretty well with it. very clever jean and oh so true. Judy, I am pretty certain we already have laws against that. It sounds to me that enforcement is the problem at least in this case. Maybe it's time you got out of the gutter you think Conservatives frequent and see what is really happening. No wonder you are all screwed up. @judy I wonder how many people on here even had a first grade teacher? It has been a lot of years, and a lot of water under the bridge, but I remember my first grade teacher....Mrs Jones having a gun is a crazy scary thought. It was long before the era of home schooling, but her having a gun at school would have moved the era of home schooling up 5 or 6 decades for a lot of parents. There was a time when teachers were respected. My first grade teacher was down right scary! Back in the day you messed up, you got a look. If you kept it up, you got the Board of Education! No lawsuits, no apologies! Teachers were in control of their classrooms and not the students! There was respect back then! Sadly, we are now in a different time! Society has changed! Not really Steveo there have always been some teachers who can kept order in the classroom, and others who are helpless against student bullying who will let those members of a class so disrupt a room that no one can effectively learn. I had a 3rd grade teacher who couldn't keep order, the classroom was in a constant state of mayhem, and she was in constant tears. Across the hall was this little 4 ft. 9 in. 60+ lady that taught 4th grade. She only had to look at an offending student for them to sit up straight and behave. @jean, yeah! there are always exceptions. I have had some wonderful teachers and then again, there were those that seemed not to care one way or the other. Yes Jean, I very well remember my first grade teacher Mrs. Fricke. Not a very good teacher. But I doubt at the age of 5 and 6 that I could judge whether my teacher could own a gun. However, the question was whether a felon should own a gun. I am certain the law prohibits any felon from owning a gun. A person who buys a gun for a felon has also broken the law. So, it isn't that we don't have laws against felons buying guns. They just aren't being enforced. I agree the person who buys a felon a gun should be in the slammer with the felon. JUDY,JUDY,JUDY, HOW IS IT YOU HAVE SO MANY GUNS IN YOUR SAFE ROOM. YES JUDY YOUR SAFE ROOM. YOU SHOULD NOT TELL ALL TO JUST ANYONE IN THE CHAT ROOMS. REPUBLITARDS HAVE TO REALIZE THAT IT IS NOT THE DEMOCRATS THAT DEFEAT THEM, IT IS THEIR OWN INSANITY THAT MAKES PEOPLE RUN AWAY FROM THEM. THAT SPENT THE SAVINGS OF UNION WORKERS TO PUT THIS SORRY AS---BACK IN OFFICE. Mass shootings = proof that gun regulation is necessary. I'm not for over regulation of guns, but why was a mother with a mentally challenged child who was himself rejected allowed to have a semi-automatic weapon? And why did she need a semi-automatic weapon? How would a gun salesman know that? Privacy laws would prevent that info from being made public! I can't even pick up my wife's prescription much less have a doctor talk to me about her medical history, even though I already know it! No way under current law for a salesman t ask about medical issue of family members. I'm n not even sure that qustion could be asked of a potentional buyer. Someone correct me if I am wrong! You most certainly could do both, but maybe your wife hasn't considered signing the HIPAA paperwork that would allow you to see her medical records, or pick up her prescriptions. I've signed HIPAA paperwork so my children, their wives, and even granddaughters can be informed of my medical condition. Good point Jean, We wil do that! I wasn't talking about guns I was talking about how Steveo would be able to have access to his wife's medical condition. But how would those who do background checks have known there was a person in the Lanza home who shouldn't have access to a gun? Mrs. Lanza was the person whose background was being checked, and she had a clean record. Facts are: those who do background checks will never have all the information,.and maybe that in itself is the best reason why guns that are only used for killing people should not be available to people other than law enforcement. No one can hunt for wild game with these guns...they are primarily made to kill man. And then there are those guns which are sold for which there has never been a background check made....through the gun show loophole. Your post is my point. Salesmen would never have known about the son due to medical privacy laws. The fact is the only one who knew about her household was the mother who is now deceased! The last point I want to make is this IF any thing is banned, the weapons that go under ground wil not be affected, which mean just like illegal drugs, the criminal element will still have access. Truly, what happened last week is changing the national conversation! I am in agreement with you. Arming teachers is not the answer. At the same time, armed guards in the hallways is disconcerting as well. I have seen that in the Big Apple along with metal detectors and such and not just in high schools either! Makes you wonder if you are in school, or in prison. The problem is there are some in society that just does not value life. I had someone who wanted to state that England has had more school shootings than the United States which actually not true. so I checked the Time Line for School Shootings and Mass Shooting Worldwide which covered all school shooting and mass shootings since the first of 1996 up to date. The list included: 1 in Scotland; 1 in Argentina;1 in Yemen;1 in Netherlands;1 in France; 1 in Norway; 1 in Brazil; 2 in Finland; 2 in Canada; 1 in Bosnia 3 in Germany; and 1 in Sweden. The list is mind numbing...and the NRA says more guns are the answer...I think not! It is such a shame that too many people want and expect handouts for their existance. There was that black lady in Detroit that said we elected you Obama now bail us out. Detroit is an example of liberal politics in this country. People have forgotten, never learned how to take care of themselves. Now the bottom is about to drop out and people have no clue what to do. Therer is an old saying CHARITY STARTS AT HOME. But people have never heard that because of all the Social Programs now in place. With Obama Care, higher Taxes for those above $200,000.00 few jobs it is going to be tough until people start learning to take care of themselves. The road the hell is paved with good intentions. If that is how you feel about it, you could always send them back your welfare check. What Welfare Check Jean? Harry Truman said The Buck Stops Here. Bill Clinton said, The Buck Never Got Here. Barrack Obama said, Buck, Where? Oh, raise Taxes on that Sucker, that'll fix him. A Tax, Tax here, a Tax. Tax, there ol Obama had a Tax, Tax Farm, Ei Ei O. More Taxes in the Pipeline for everybody! NO CAFF. IF I AM BEING A SH-T IT IS NOT MEANT TO BE THAT WAY. I JUST HAVE AN OPINION ON DUMB COMMENTS. Ray just sounds like a welfare check. STRANGERS. ANY ONE OUT THERE MAY COMMENT IF YOU HAVE A RELAVANT THOUGHT. WE CANNOT PROTECT OUR KIDS NOR OURSELVES FROM ALL OR FOR THAT MATTER ONLY VERY FEW THREATS. BE EASY NOR FAST,NOTHING EVER IS. TOUGH LOVE IS JUST THAT--GET USED TO IT FOLKS. Best wishes for the season to all! . I will be out of town with family,and the great grandbabies for a few days. MeMa needs to do some more cooking, and get this show on the road. Who knows by the time I'm back they may have moderated my previous message! Mele Kalikimaka! to all during the happiest of holidays. May 2013 bring great things.